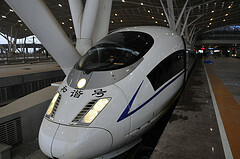 "The high-speed rail technology implemented in China is not that much different from the TGV, Germany's ICE, and the Shinkansen," says Rongfang Liu, a rail expert at the New Jersey Institute of Technology in Newark. What is notable, she and others say, is that unlike many high-speed lines that repurpose older tracks, this one was designed from the ground up for very high-speed operation over hundreds of kilometers. Bridges and tunnels, as well as the concrete bed beneath the track, have been designed to safely rocket passengers around, through, or over the natural and man-made obstacles that would otherwise force the trains to slow down. One of the quirks of Amtrak's purportedly high-speed Acela Express in the Northeast is that it only actually hits its top speed of 150 miles per hour for a few brief moments, in two flat stretches between Rhode Island and Massachusetts. But the train only averages 80 miles per hour between New York and Washington DC, partly because that's all the tracks can sustain.